Here’s part 2 of my favorite iPhone / iPad apps for ministry and everyday life. 1. Bible – LifeChurch.tv – This is my go to Bible reader on the iOS platform. I’ve tried others, but I always come back to this one. The team at LifeChurch just keeps making it better and better. 2. 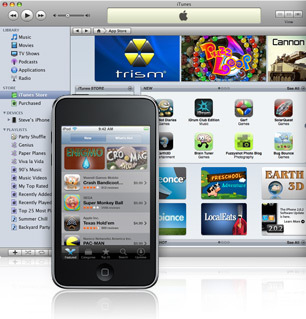 AppShopper – As a app junkie, I’m always looking for new apps and AppShopper is a great way to find out what’s new. One of my favorite things about this app, is creating a wish list, and you’ll receive and email when the app is updated or on sale. I’ve saved a ton just waiting till the app I wanted was on sale or even free. 3. Kindle – This is my go to book reader. I think iBooks is prettier, but I love Amazon’s pricing and I love being able to access my books on all my devices. I always look to kindle first for ebooks. 4.GarageBand – This one is iPad only but if you are interested in making music, this is an amazing app. It’s the touch version of the popular app on OS X. You can play piano, drums, or guitar and record them. It’s also been so fun watching my kids make music of their own and get into it. I love this app. 5. iMovie – This is my favorite quick video editor for iOS. Again, the touch version of another of Apple’s desktop iLife apps, but it works so well on iOS. It’s great for simple videos on the go that you can upload directly to YouTube or Flickr. Easy to use and fast. 6. OmniOutliner for iPad – Another iPad app here, but it’s so useful. I often organize my thoughts in Outlines, and this is a great tool for that. I use it for projects, teaching, writing, and just organizing. It also works with the desktop version which I also really like. Like all Omni apps, it’s a little on the expensive side, but I always feel it’s worth it in the end. 7. Documents To Go® – Office Suite – I’m a big fan of Google Docs and do a lot of my writing there, and this is best Google docs editor I’ve used. I can access all my google docs there so I can edit or write on the go. It also can access microsoft office docs stored in dropbox so you can edit or access on the go. Bonus Pick: Live Curriculum – OK this one is a little selfish, but I’m pretty proud of it. It’s the first app I helped design and produce. It’s the app to access Simply Youth Ministry’s LIVE Curriculum. Click here to learn more about it. There are so many other apps I use all the time, but I’d love to hear about some of your favorites. What ones did I miss? Tell me in the comments. Don’t know about iPhone, but here are a few droid apps I couldn’t live w/o. 1. Starbucks: This one’s new for droid users and allows me to reload and scan my gold card on my mobile device. 2. Soundhound: I used to hate when I heard a great tune on the radio but they never gave the artist name or track title. Soundhound solves this problem with the click of one button. As soon as I hear a song on the radio that I want to know more about, all I have to do is open Soundhound. It listens to the song via the internal mic, then tells me the song info, and gives me option to purchase it on the spot. 3. WordPress- I write for 2 different blogs (my personal and church blogs). My WordPress app lets me access either one and post on the fly. 4. Pulse- Pulse is my favorite blog aggregator. The reason is because it’s GORGEOUS! The graphic interface is sleek, and I can create multiple pages for different categories of material I read (YM, Marketing, Tech etc.) Try it out today! 5. Playmaker Buzztime- I don’t use it often but it feeds my geeky soul! Buzztime is the trivia game that you play at most pizza/wings places (think Buffalo Wild Wings). While every other sap has to use the clunky console, I answer the on screen trivia questions right from the coolness of my Galaxy Tab. But some of the ones I use regularly that you didn’t mention – Feedler Pro, SpringPad, Places, Slideshow Remote, Camera+, Attendance, and Week Calendar. These are all ones on iPhone though, very curious to sometime be able to see how the iPad apps work.